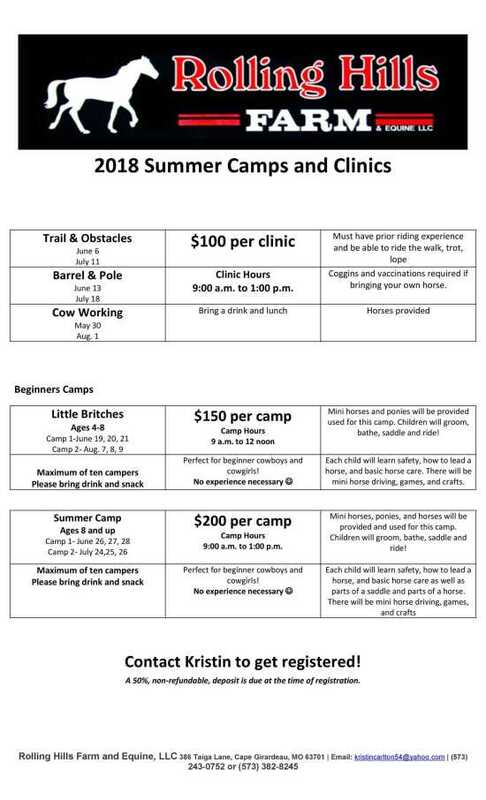 This summer camp is designed for young beginner cowboys and cowgirls ages 4-8. Guaranteed to have a hootin' and hollerin' good time on our beautiful 70 acre farm. This is a three day camp. Kiddos will come home dusting off their jeans after wrangling our mini horses and riding those ponies! Knowledgeable instructors will teach safety, grooming, bathing, leading and riding. Bring a drink and a snack. Helmets provided. Long pants and closed toe shoes required. Cost is $150. Camps will not be cancelled in the event of rain as we have a spacious indoor riding arena and other covered enclosed facilities. Deposit and pre registration is required.